However, the DDS compression algorithm is patented, which means that it is not readily available for open source graphics drivers used by most Linux distributions. Dependent on the specific hardware, this may or may not be a problem (modern graphics cards typically do not need the driver to process DDS, for older graphics cards there are non-patented workarounds available which decompress the DDS on the software level). The development team is concerned about making the FlightGear experience pleasant for all users, hence we would like to gather feedback how many users would be affected by a change in practice. If there are no problems reported, FG will change defaults to textures in DDS format with the 3.4 release, and then phase out the use of png textures. 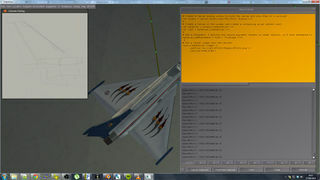 Some months ago we decided to host our aircraft on an SVN repository in order to relieve fgdata. The fgdata repo would be a mirror of the base package. This repository is named "FGAddon" because its content is not required to run FlightGear but provides a new feature (aircraft in this case); this is usually called an "addon". Advantages On the user side, the most important feature is to be able to checkout only desired aircraft, as you no longer need to download the 400+ aircraft at once. On the developer side, the most important interest is to have a base package (fgdata) which is lighter to sync for new contributors and easier to keep up to date. If you are used to use Git, svn co and svn up are similar to git clone or git pull. The aircraft will remain in the fgdata Git repository for a few months, until everyone has transitioned to the SVN repositories. Background For our aircraft developers who don't regularly read the mailing list (even though any aircraft developers should already be subscribed), please read this topic. The previously introduced <usage>interior</usage> tag has been extended to support MP/AI models. A new level of detail (LOD) key is added to the LOD dialog which affects the distance of loading the interior model of AI/MP models. The default value is 50 meter. In other words, the interior model of AI/MP is loaded only when you are at less than 50 meters of the AI/MP models. See Modelling guidelines for more tips on how to create optimized models. Recently, we've had an interesting discussion on the forum where some of FlightGear's threading issues were discussed, and a few contributors mentioned that Ada would have better tasking support than C++ because C++ support for tasking/multi-threading is generally considered fairly "low-level". Other programming languages, like Ada, provide native support for multi-threading using built-in primitives like tasks and protected types. Meanwhile, a few contributors have teamed up to explore using Ada in FlightGear to make some experiments. We're hoping to document the steps required to extend our CMake build system to support optional modules implemented in Ada as discussed by onox, Flying toaster and Hooray on the forum, including support for mapping existing C++ classes to Ada (e.g. from OSG and/or OpenRTI). The main goal being here to leverage Ada's native tasking support for prototyping optional features that do not have to be running in the FlightGear main loop. We've already found some existing CMake modules that we can reuse: The PLPlot project is implemented using C, C++ and Ada and provides a set of CMake modules that are scheduled to be merged into CMake soon. Hooray has copied those files into a branch of $FG_SRC and ended up with a working build environment that successfully links in Ada modules. For starters, we'll be playing with optionally allowing fgcommands to be implemented in Ada, as well as new SGsubsystems. Next, we'll be exploring how to add thin bindings using -fdump-ada-spec for existing SimGear/OpenRTI (HLA) headers and document the whole process on the wiki. Using -fdump-ada-specc to create bindings for SG/HLA classes to create standalone HLA federates in Ada would make FG pretty compelling for anybody doing this kind of thing professionally, because Ada simply happens to be widely used in the aviation industry, and it seems there are even bindings of complex stuff like OSG available. 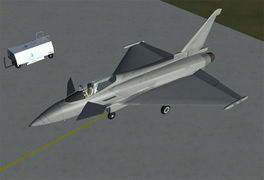 To document the implementation on a FlightGear aircraft from the aircraft developer's point of view, I've chosen one of my pet projects, the Eurofighter EF2000 V2.0 which will be released in early 2015. The intention is to use Canvas to allow multiple textures per livery, in this case those textures being the original livery paintwork and another, alpha-transparent texture consisting of dirt streaks specifically added to the livery paintwork to match with vents, seams and other sources of grimy build-ups. The intention is to allow dynamic management of the transparency of the dirt layer according to time and exposure to various elements, maintaining compatibility with the standard livery switching method and working similarly whether Rembrandt is enabled or not. A first (failed) attempt to put a canvas onto a model object in place of its texture. 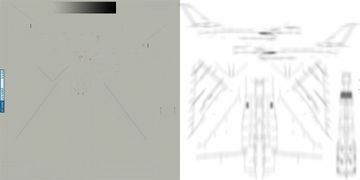 The EF2000 showing a dynamically-changed texture on the fuselage - at the moment, the resolution appears to be wrong and the UV coordinates seem to be being ignored. 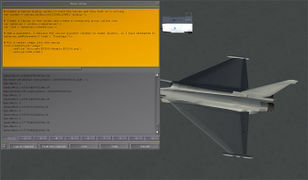 Changing the dialog window size to be the same size as the texture fixed the issue - note that the fuselage sections are free of dirt (except the APU exhaust smudge, which is a special case) where as the wings and tail have integral dirt in the texture. 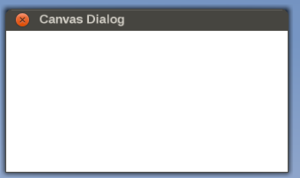 A full-screen illustration using the updated Canvas code to make the canvas independent of the window, but with the window still displaying the canvas. 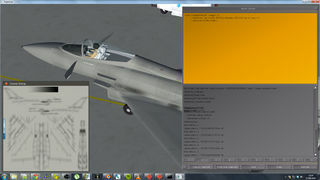 Here, only the base "clean" paintwork texture is added to the fuselage element. After creating a canvas with the base "clean" paintwork texture, another child is added containing the dirt layer transparency. The effect is seen both in the dialog window and on the airframe. This month, the interview comes back. Hey everyone, I'm ZLSA. I've used FlightGear for a while now, but I only got into the development side recently. Um, I'm supposed to ask myself questions? Wait, nobody said I'd have to ask myself questions. What is your forum nickname, ZLSA? ZLSA. How long have you been involved with FlightGear? The first version I used was 1.9.1, I think. So circa 2008? What are your major interests in FlightGear? Well, I like 3d modeling and I'm rather good at it. Do you think I'm good at 3d modeling? I think you're pretty good at it. So my primary interest in FlightGear is modeling things; I modeled the Piper Archer CX exterior and interior. I also enjoy writing Nasal. What projects are you working on right now? Well I worked a bit on the Piper last night (just minor tweaks). Did you know that unless you use textures, the ambient color shown in FlightGear is always gray regardless of the exported ambient color? Makes cockpits look awful. Anyway, right now I'm working on a tee hangar. FlightGear doesn't seem to have any tee hangars. What do you plan on doing in the future? Finish the Piper and add more scenery objects. Having shaders on full with Rembrandt on doesn't help if the only buildings are 80-meter wide cubes. Why is it that you are interested in flight simulation or aviation in general? FlightGear sparked my interest in aviation when I first played used it. I was just wondering what this fgfs program was. Are you happy with the way the FlightGear project is going? In general, yes. It's come very far in the past few years. The biggest issue in my opinion is the scenery; I realize that at this point it's infeasible to redesign the scenery model to support dynamic subdivision and landclass transitions, but nothing breaks immersion more than flying over the desert until it suddenly turns into grass. What do you enjoy most about contributing to FlightGear? Seeing my creations used by other people. Are there any "hidden features" you have worked on in FlightGear that new users may miss? Nope, sorry. What advice can you give to new contributors who want to get started on their first aircraft/new feature/Nasal script? Well I'll start this off with an example: when I first started making aircraft (it was an abysmally-modeled aircraft with horrible proportions that I stupidly released) I had no idea what I was doing. It took me several hours to figure out that the <PropertyList> XML file was actually just the property tree in XML. That made things much easier for me. The same thing happened with Nasal when I realized that the name of the <file> parent tag was just the Nasal "namespace". So it might seem complicated, but once you play around with things for a bit, it will make sense. Have you previously used other flight simulators or simulation software in general? No. How does FlightGear compare in your opinion? If FSX and X-Plane were both free and open-source, I'd probably choose X-Plane because of the incredible graphics. But since they're both closed and paid products (and FSX is Windows-only while I use Linux), I would (and did) choose FlightGear over the other two major contenders. What was your first impression about FlightGear? How the heck do you pronounce ornithopter? Compared to other flight simulation software, what are FlightGear's major benefits in your opinion? It's free and open source. That attracts people, some of whom will contribute back. That is a huge benefit that's often overlooked. Do you think it is necessary to know how to program in order to contribute to FlightGear? Of course not. It would help, but it's definitely not needed. If every 3d artist reading this contributed a high-quality (but low-poly) model to the scenery database, it would make a huge difference. Similarly, placing objects with the UFO doesn't require any programming and makes a huge difference in the quality of a single FlightGear's airport. Have you ever used FlightGear professionally or for educational purposes? No and yes. While I haven't ever sat in any GA aircraft, FlightGear has helped me understand flight much better than reading and watching videos ever would. What about FlightGear as a "game", do you think it can be used as such? Of course. It can also be used as a filler for your hard drive. It's whatever you want to use it for. On average, how much time do you spend working with/contributing to FlightGear? Probably in the hundreds of hours at this point. Which of the more recent FlightGear developments do you consider most interesting/appealing? Procedural textures. Rembrandt. Atmospheric light scattering/cloud shadows. What do you think could be done to attract even more new users and contributors to FlightGear? Higher quality in general. Many users want a flight simulator that just works and looks good; currently, FlightGear is not suited to them. What about interacting with the FlightGear community? Any tips/experiences you'd like to share? 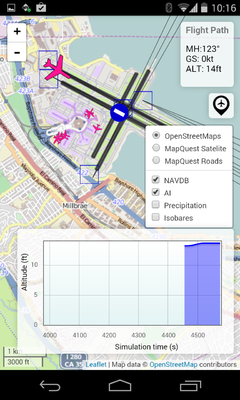 Back up your FlightGear data directory and play around with things. Is there anything else you'd like to share with us? No. Good day then, and thanks for agreeing to this interview. No problem. This Airbus A300-600 has been developed by Airbus330 and Toryx (Developer of the A310), using many parts of the A310. The flightdeck was taken from the A300-600ST, but has the addition of a Cockpit Controllable Autopilot. It has a reasonably detailed exterior model, with accurate flap, speed brake, and spoiler position animations, tail surface animations and tyre smoke. The interior now consists only of the cockpit, but that is fairly detailed except for the overhead panel. The version currently available for download from the forum or wiki has only the A300-603, but a version with the A300-600F will soon be released, (as soon as I make enough liveries). Currently, the engines are always on, but I am now working on an autostart system, which will also be in the next release. Next month, in the weekend of 1 and 2 November 2014, a team of FlightGear developers will present FlightGear to the public at the world's largest flightsimulator event. The so called FSweekend is held yearly in the Aviodrome aviation museum at Lelystad Airport (EHLE), the Netherlands. The team would love to welcome you in Lelystad! This page was last modified on 4 October 2014, at 16:17.